It’s funny how our tastes change as we grow older, and it’s worthwhile to give vegetables that we didn’t like as a kid a new chance. Preparing some vegetables with fruit also helps to create tasty dishes of vegetables that people don’t usually like. This rutabaga pear mash is delicious. We have really enjoyed it over the holidays and will be having it more often through the cold months. It does not need, oils, cream or butters. Prepare the rutabaga and pears. Place in a steamer and steam until the rutabaga is soft. 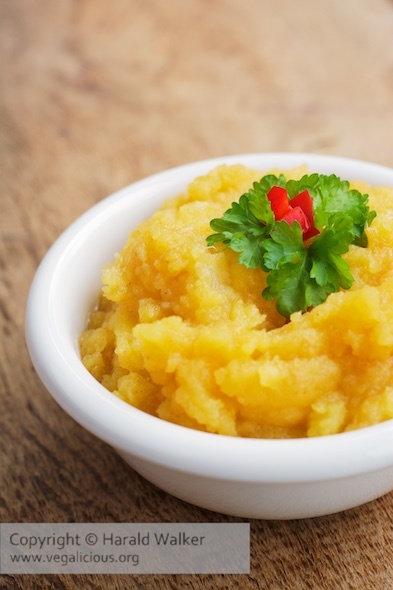 Puree or mash the rutabaga and pears together (in a food processor or with an immersion blender). Add the sweetener and puree well. Season the mash with ½ teaspoons salt, some white pepper and a pinch of cinnamon. Posted by Chris Walker on November 27, 2014 in Pear, rutabaga, Side Dishes.